Hellebores, a part of the Ranunculaceae family (“buttercups”), is actually not a native wildlflower of North America. 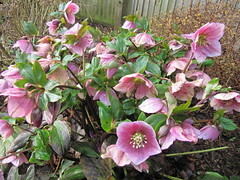 Natives of Europe and Asia, Hellebores here which have escaped their garden borders include blooms in colors ranging from white to pink as well as yellows and blues. Five sepals surround petals which contain nectar, making them a good addition to butterfly and pollinator gardens. Also called “Christmas Rose” or “Lenten Rose,” Hellebores are quite frost-resistant and hardy to zone 6 and above with summer shade. They typically start blooming in December through May. Seed can take 6-18 months to sprout, but propagation by division is fairly easy. Trailing Arbutus, Epigaea repens is a trailing evergreen shrub. It is a member of the Ericaceae, or heather, family. 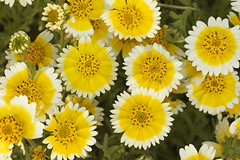 Found in 29 eastern United States and Canada, from Florida to Manitoba, it prefers rocky, acidic soil and woodland habitats. It is on the Endangered list in Florida, rated as “Exploitably Vulnerable“ in New York and on the Watch List of threatened species in Indiana and a Regional Forester Sensitive Species plant in the Hoosier national Forest due to its slow rate of recovery after disturbance & collection. Pink-white flowers bloom in early spring to April. Transplant only from reputable nurseries, Trailing Arbutus requires mycorrhizal association to grow. Thanks to all who entered & please look for more polls on our Facebook page! I never used to like cactus much until I lived in the desert near Palm Springs. This barren, hostile environment with summer temperatures that routinely got up to 120, spawned weirdly wonderful and exotic plants like the Ocotillo with its red flame-like blossoms at the tips of its long, bare, thorny branches or the beautiful palo verde tree with its green photosynthetic bark, bare branches and bower of yellow flowers or the desert willow with its orchid-like purple blossoms. Fortunately, I grew to appreciate and even love the austere beauty of the desert, lovely sunsets and the weird but wonderful plants found there. That’s where my fascination with cactus and succulents began – the odder, the better! After being “bitten” by some of my cactus while caring for them, I became particularly fond of thornless varieties like the Velvet Cactus or Stapelia gigantea. Early last October when my Stapelia began to bloom, it was a much anticipated event that I looked forward to. Also called the Carrion Flower or Starfish Flower, the Velvet Cactus is a succulent with deeply ribbed, fat stems, toothed along the angles (see in the photo below) with a velvety surface. It produces large flowers up to 20 cm across with a pale yellow color and transverse red lines covered with purplish or crimson hairs, exuding an odor which attracts its chief pollinator, the fly. As the bud appeared and began to swell, my anticipation began to grow too until at last the flower opened. The bloom is wonderfully weird with its large star-shaped flower, hairy petals, weird squiggly pattern and, of course, the tiny flies. Within a few days, the flower had crumpled up. It was over for this year. Then as the nights got cooler, it moved indoors for the winter. How does Stapelia gigantea grow? In its native South Africa it would be comfortable in a Zone: 9. Here they require full sun (can withstand extreme heat) and need only moderate water during the growing season and a cool, dry rest period during the winter. Stapelia gigantea can be propagated by taking stem cuttings in the spring when new growth begins and letting them callus for 2 -3 weeks before planting. Plant in a well-drained soil mixture (2 parts loam to 1 part sharp sand) with small pebbles mixed in for drainage. (I use the commercially sold Cactus Soil Mix.) Fertilize once during the growing season with a balanced fertilizer diluted to ½ strength. What weird and wonderful plants do you like to grow?